This results in the sequence 0, 1, 1, 2, 3, 5, 8, 13, 21, ... (OEIS link). 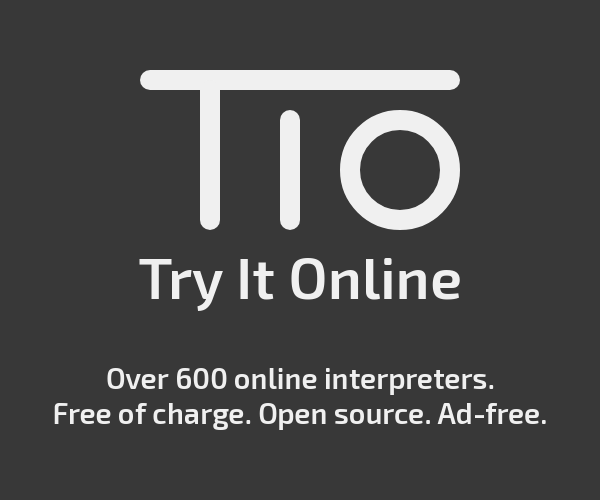 In this challenge, we'll be focusing on only the strictly-positive values (so 1, 1, 2, 3, ...), and you can choose zero-indexing or one-indexing, but please state which in your submission. You can see the f(1)=1 as the starting square (highlighted in blue), the f(2)=1 square placed to the right of it, the f(3)=2 square placed up from there, the f(4)=3 square placed left and so on. The next square would be f(9)=21+13=34 and would be placed to the bottom. This is the partial tiling method we'll be using in this challenge. The percentage of squares that the queen can move to versus the total number of squares, given the queen's particular position on an empty board, and including the queen's own starting position. 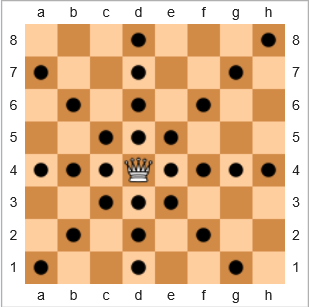 For the example moves above, the queen's coverage is 28/64 = 43.75%. 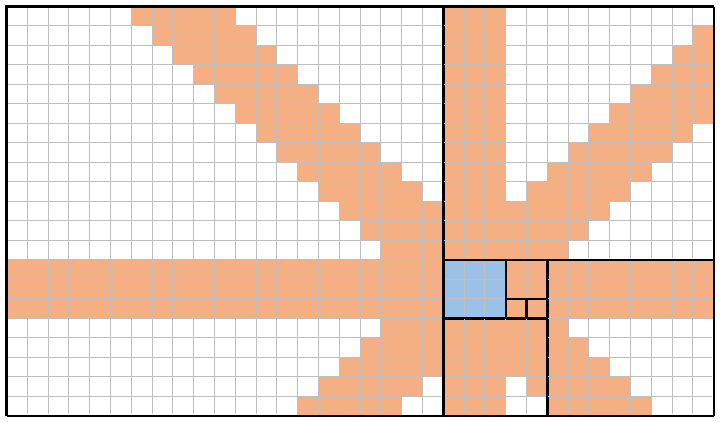 If the queen was in the upper-right h8 square, the coverage would be 22/64 = 34.375%. If the queen was in e7, the coverage would be 24/64 = 37.5%. The n represents how large the tiling is. The example tiling above, with the 21 square on the left, is a board of size n = 8 since f(8) = 21 (when zero-indexed). The x represents which of the Fibonacci squares is used for the queen(s) placement, for calculating the coverage. The queens are placed one-at-a-time on each square in that particular Fibonacci square tile, and the total coverage is the summation of the individual (unique) coverage. For example, here is an image of n = 8 (the same tiling as above) and x = 4 (corresponding to the f(4) = 3 square, shaded blue). By placing a queen one-at-a-time into each of those nine blue squares, the queens can (combined) cover every square that's shaded orange. The total coverage in this example is therefore 309/714 = 43.28%. Quite obviously, any time that n = x, the coverage is going to be 100% (for example, with n=8 and x=8, you can see that every square on the entire board is going to be covered at least once). Conversely, with a suitably large n and x=1 or x=2, the coverage is going to approach (but never reach) 0% (for example, with n=8 and x=1, the coverage is a paltry 88/714 = 12.32%). Given two such input numbers, you must output the coverage percentage, accurate to two decimal places. Please specify how your code handles rounding. The input and output can be given in any convenient format, but must be accurate to two decimal places. Please specify how your code handles rounding. Assume no other pieces are on the board or otherwise interfere with the moves. Simulation of the problem statement. 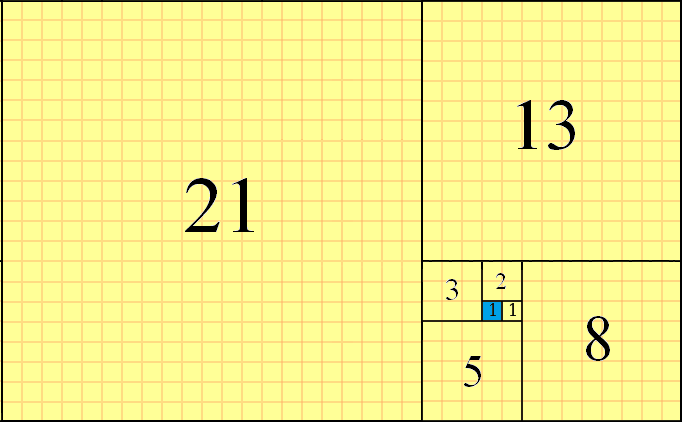 I start by creating the grid, looping through each new fibonacci number to increase the square size. I store the index in each cell, so that it's easy to find where the queens will go in the next step. Then, I find every cell that should have a queen in it, and mark each threatened square with a zero. I skip the cells where the queens are so that I don't have to worry about backtracking. At the end, I count up the cells that are cleared, and the cells with queens, and then divide it by the total number of spaces. Multiply by 100 to get the percent, and round to the nearest two decimal places. Defining a function that takes in both the tiling size n and the queen's fibonacci square number x. The ouput percentage is porperly rounded to two decimal places (in the footer, where all output is taking place). f is a two-dimensional array containing the board information being initiated to 0. Then, the fibonacci chess board is calculated and populated with queens where queens shall be. Those queens are then moved to every place they can be moved; all positions are counted and printed as a percentage of the entire board. Not the answer you're looking for? Browse other questions tagged code-golf chess fibonacci or ask your own question.